LYCRA® fiber revolutionized hosiery in the 1960s, and the introduction of LYCRA® 3D technology thirty years later took sophisticated good looks, comfort, shape retention and garment durability in this category to a new level. The latest generation of this technology incorporating our innovative LYCRA® T188C fiber raises the bar higher still. Premium hosiery is a particularly challenging segment. When consumer expectations are already high, it takes something special to stand out in a crowded marketplace. The latest LYCRA® 3D technology delivers benefits that enable specialist mills, brands and retailers to respond to demanding consumers’ needs. LYCRA® T188C fiber has been developed for legwear applications that require better steam settability than is achievable with standard elastane. Its superior response to heat enables full boarding with excellent layout and foot definition, and the so-called ‘thermal memory’ effect of the advanced polymer structure enlarges the ‘relaxed’ dimensions of the finished hosiery product. The fiber science is complex, but the consumer promise is simple. Knitted into every stich of every course of the hosiery fabric, LYCRA® T188C fiber delivers unprecedented comfort and elasticity, and the more true-to-life counter appearance of finished products helps boost sales by giving shoppers an immediate sense of how the garment will look on legs. The 3D story doesn’t stop there. The LYCRA® brand is a powerful differentiator of premium legwear at retail: global research shows that its visibility on hosiery products influences the preferences of a remarkable 89% of women shoppers. 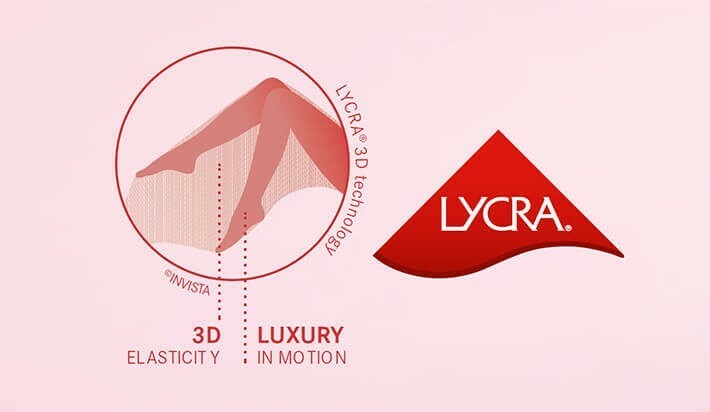 INVISTA is supporting LYCRA® 3D customers with a dedicated pictogram for hosiery packaging encapsulating its key benefits. Check our Trademark Licensing Agreement page for further information. LYCRA® 3D technology moves with the times. If you are a mill, a brand or retailer targeting the premium end of the hosiery market, it is the shape of next year’s new business opportunities.